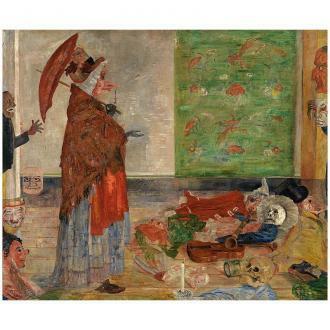 The Scandalized Masks (1883, oil on canvas, Brussels, Royal Museum of Fine Arts of Belgium) is the first work of James Ensor in which the mask thematic appears, albeit without the symbolic dimension that his later mask paintings would receive. Ensor found inspiration for his masks in his family‘s souvenir shops, in the Ostend carnival processions and in the Bal du Rat Mort. The Strange Masks (1892, oil on canvas, Brussels, Royal Museum of Fine Arts of Belgium), Death and the Masks (1897, oil on canvas, Liège, Museum of Modern and Contemporary Art) and The Intrigue (1890) appear as records of a moment of a few carnival goers. However, Ensor twisted the original meaning of the mask. The happy, carnivalesque figures conceal the visage of those who Ensor had for so long already menaced, dominated, tormented and beguiled. Masks and caricatures gave him the opportunity to express his non- conformity and to vent his frustration. He also provided masks and other Ensor attributes to older works, by which they took on a new dimension, such as with the Astonishment of the Mask Wouse (1889) and Old Woman with Masks (1889).